Parsley is abundant right now and to me that means only one thing–tabouli. 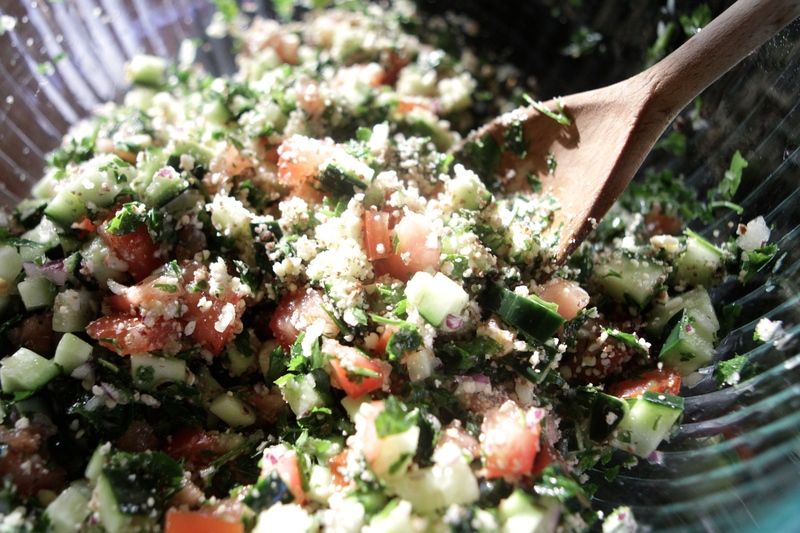 Traditionally, tabouli is made with bulgar, yielding a distinctly nutty flavor while also lending some bulk. Here, cauliflower and almonds replace the bulgar for a grain free alternative that is bright and crunchy and full of detoxifying sulphur compounds and antioxidants. I like to mix in a dollop of greek yogurt and serve it alongside chicken or lamb. Place the almond in the food processor and pulse until coarsely ground. Set aside. Break the cauliflower into florets and place in the food processor. Pulse until it resembles small grains. Combine the cauliflower and almonds, then fold in the parsley, mint, garlic, tomato, cucumber, and pomegranate seeds. Drizzle the olive oil and lemon juice, and sprinkle with allspice, salt and pepper. Mix until incorporated and season to taste.